Welcome to the first Bridal Bouquet Monday! Each Monday we will bring you a new spin on the traditional bridal bouquet. Be different and stand out on your big day! 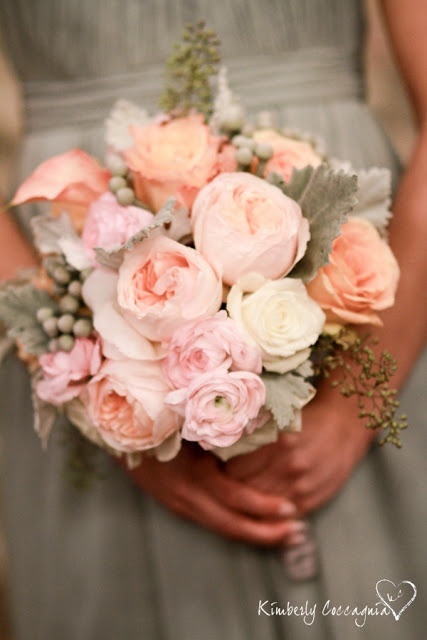 This bouquet features garden roses, seeded eucalyptus, dusty miller, ranunculus, and calla lilies. Not only do I love the floral selection, but also the colors! Beautiful peaches, pinks, and greens. 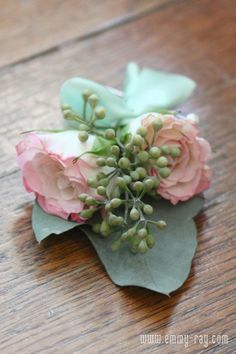 You can pull the florals together by using seeded eucalyptus and roses in the boutonnieres. We hope you enjoyed today’s bridal bouquet Monday! Check back tomorrow for beauty tips! Don’t forget to sign up for our emailing list so you can be notified when we make a new post! This entry was posted in Bouquet Monday and tagged Bouquet Monday, Bridesmaid Bouquets, eucalyptus, green bouquets, roses, seeded eucalyptus, succulent weddings, wedding bouquets. Bookmark the permalink.